Like all of you, I'm on a crazy Althea box shopping high. Their boxes are very well curated and I've been lemming for them box after box. In between releases, I finally gave in to a mini haul only to decide on 2 more boxes the day after (more on this after this post!). Apart from my planner hauls, for the past year, I have this (borderline uncontrollable) fixation on beauty tools and gadgets. I read good reviews on the Pobling Mini Ion Applicator (Php 1310) to help serums and essences penetrate into the skin faster so into the cart it went. I was out of a brush cleaner and my hair needed a pick me upper so I also got the Abbamart One-Shot Brush Washer (Php 440) and Piolang Raspberry Hair Vinegar (Php 750). All three items were nicely on sale and I only paid a total of Php 1360! 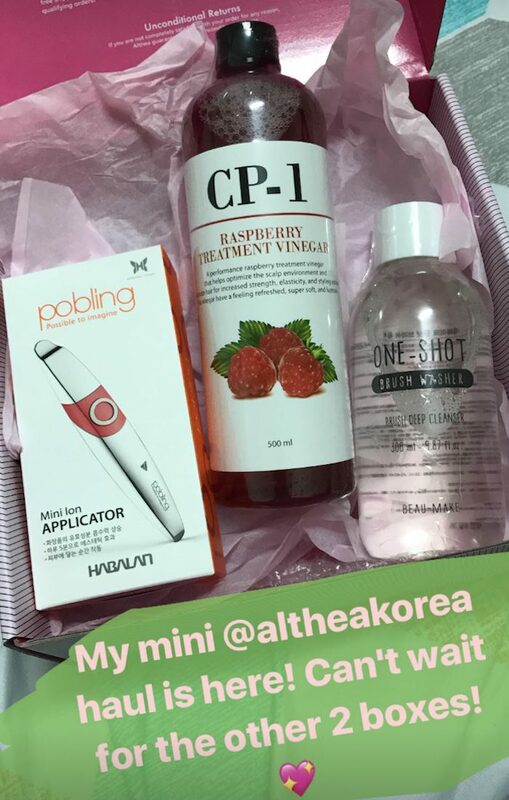 Let's talk about the Pobling Mini Ion Applicator. It's lighter than it looks which is good since there's not much added pressure on the skin. It doesn't come with batteries so I *very carefully* slip one in (I thought the white component was going to break). There's no switch -- you just have to hold the spatula-like end against the skin to make the applicator vibrate. You can use this to apply serums, moisturizers, or even sticky masks that we all hate applying with our fingers. It's also easy to clean: just clean the applicator tip with wipes and you're done. Do not use while bathing, immerse in water, or where humidity is high. Do not clean with alcohol or benzene.